Pressing on... | Living by grace, eating like a nut, exercising all the time, loving my family. Living by grace, eating like a nut, exercising all the time, loving my family. I haven’t blogged in a year! A whole year! Why? Well, allow me to introduce my baby…. It is a blast, it is hard work, it is my dream come true. And it leaves me zero time for regular blogging. I am still battling Lupus, still homeschooling, still eating gluten, corn, and soy free, still eating plant based (though I do eat some dairy now..yeehaw!). Life is good. Life is busy. I pray that Lupus will be a thing of the past someday. Because though I do not speak of it much anymore, life is still hard. I still suffer, just a lot more quietly these days. So why blog now? Because we attend a school where all nuts are banned from the campus. And I am committed to feeding my kiddos plant based as often as possible. And the kids have food allergies. And those things together are hard! BUT, I FOUND A RECIPE! And I need to share it! Our family loves these. You can find thousands of iterations of this energy ball/bite on the web. But take it from me, it is super yummy, full of nourishing ingredients, and will pass MOST allergy obstacles AND kids’ taste buds. Add dried fruit, spices like cinnamon, flavoring like cocoa powder, and so much more. Oh, and don’t tell your kids it is sun butter. 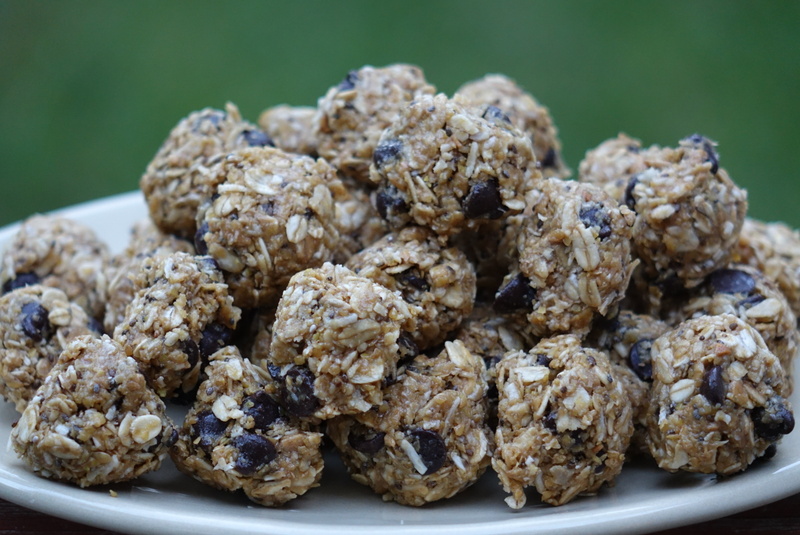 Just make them and tell them they are chocolate chip balls. Then after they love them, tell them the good news that they can go to school with them because they are NUT FREE!!! Toast your coconut at 350 for 5-10 minutes, until golden brown. It burns quickly, so watch carefully! Stir all ingredients in a large bowl. I like to add the warm toasted coconut right on top of the sun nut butter because it helps it warms up and stir in a little easier. Cover and chill for 30 – 60 minutes. Use a small scoop or a tablespoon and ball up the mixture. It helps the process if you keep a little water near by to wet your hands. Store in a freezer bag in the freezer. We eat these as the main dish in packed lunches, as snacks, as dessert, as breakfast…anytime and all the time! 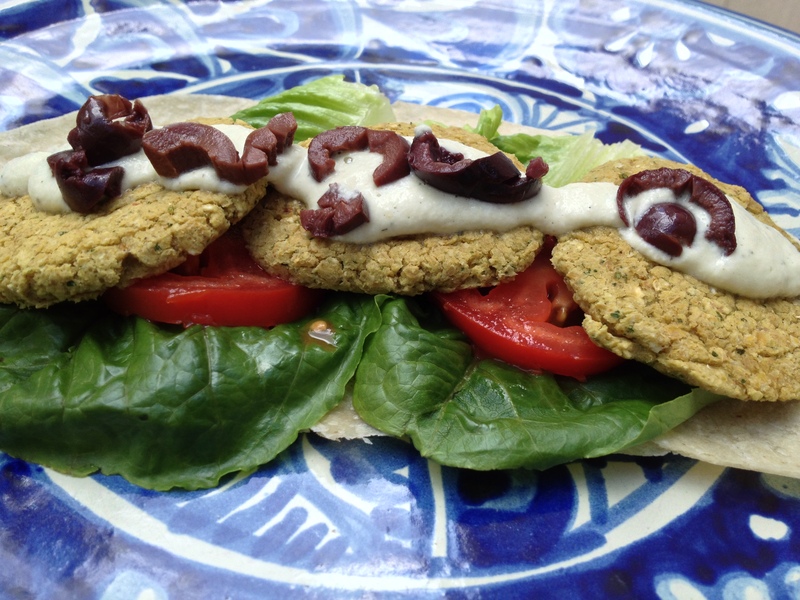 I love falafel. Didn’t even know it existed before going plant based. Don’t know where I had been hiding. But once I discovered it, I fell in love. I made many, many recipes at home to a resounding thumbs down by the kids. Every single time. A few months ago, I decided to roast the garlic before adding it in and tweaking a few other things. It worked! And now it has a new knickname….falawesome! Here is the recipe! If you soak the cashews in advance, then you can make the sauce a little ahead of time and it can be chilling. I also roast the garlic ahead of time for the falafel. 1 cup cashews, soaked for an hour in water. 1 cucumber, peeled and cut into large chunks. Place all ingredients in a Vitamix or food processor. Blend until it is smooth. Chill before serving. 2 cans garbanzo beans, rinsed and drained. 4 T milled flax seeds, combines with 8 T water. Stir and let sit until thick. To serve: brown rice tortilla, if gf, (pita, if not), tomatoes, lettuce, and kalamata olives, diced. 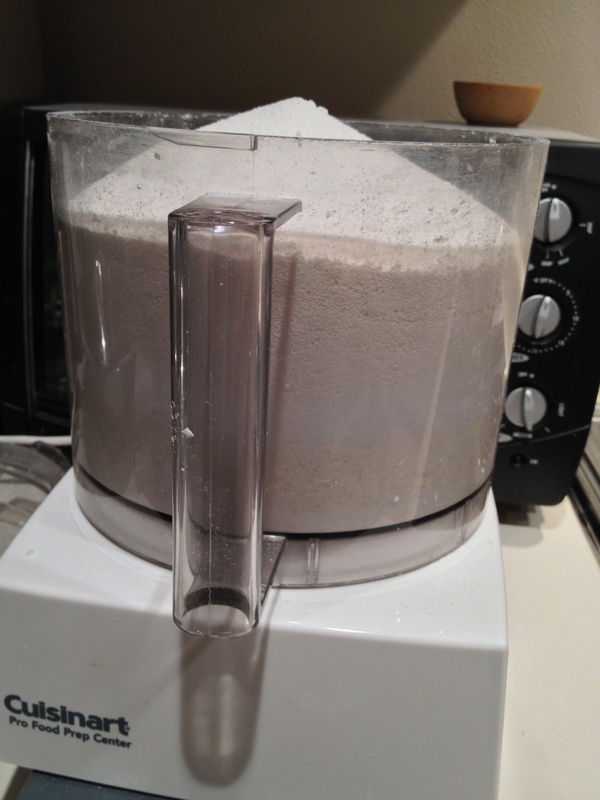 Combine all ingredients in a food processor (I use my Cuisinart). Mix until it is all ground and looks fairly homogenous. Taste it for seasoning. Add more spices if you think it needs it! Scoop into little balls and flatten the balls. I use my electric skillet and cook them on med-high heat until each side is looking toasty and cooked. They are tastier if you cook them in a pan with a small amount of olive oil. Med-high, again, and for about 5 mins each side. But I make them without the oil to cut back on unnecessary calories. On a recent trip to Austin, my mom and I ate at Boldin Creek Cafe for a late breakfast. Because I don’t often have the chance to eat gluten free, vegan sandwiches, I jumped (even at breakfast time!) at their “Chick Pea Chik’n Salad Sammich.” I’ve been dreaming of it ever since! Jennifer and I decided to tackle it today and came up with our own that does not have soy. The avocado made it creamy, the chickpeas gave it texture and substance, and the tiny pieces of celery gave it just the right amount of crunch. But we think that the little gherkins and the blend of mustards took it over the top. YUM! Total success! Place the drained chickpeas in a bowl and mash them a bit. Add your avocado and mash some more. Add your chopped pickles and celery, as well as the tahini and mustards. Add a few pinches of salt and some fresh cracked pepper. Still all together. Taste for seasonings and adjust until you think it is perfect! 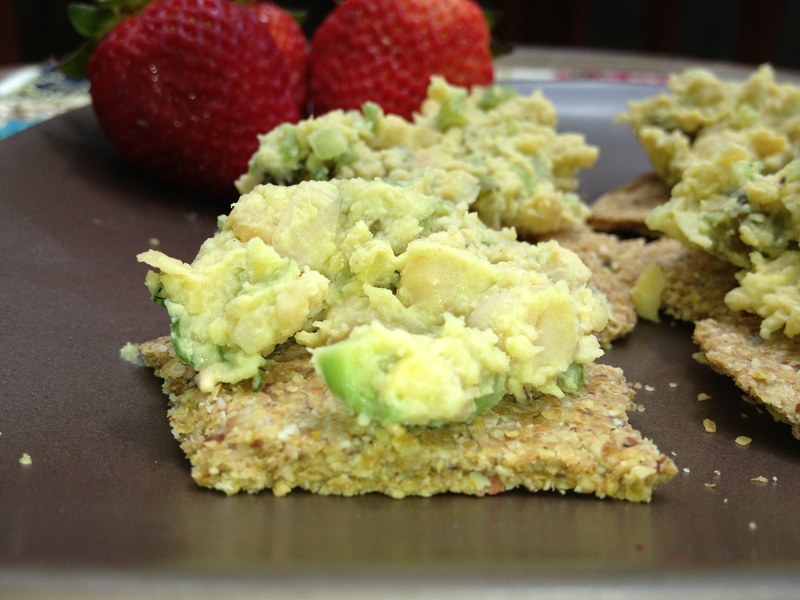 We served it on crackers that we whipped up right before making the chickpea salad. Here is the cracker recipe, only I made a flax egg in place of egg whites, added 1 T of water, and added extra nutritional yeast in place of the Parmesan. 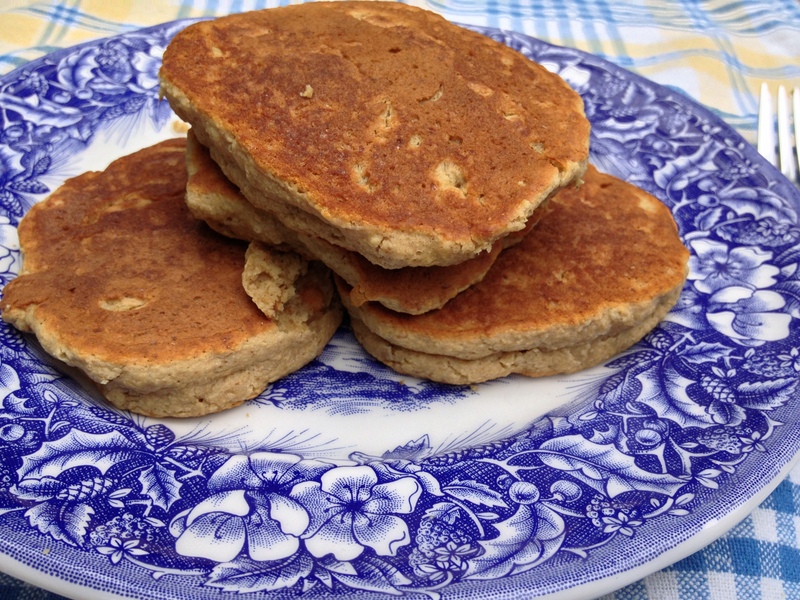 Healthy, hearty, peanut butter flax oatcakes! We have come to LOVE these pancakes and I make them on a regular basis. They are one of the very few recipes I will skip my morning shake for. 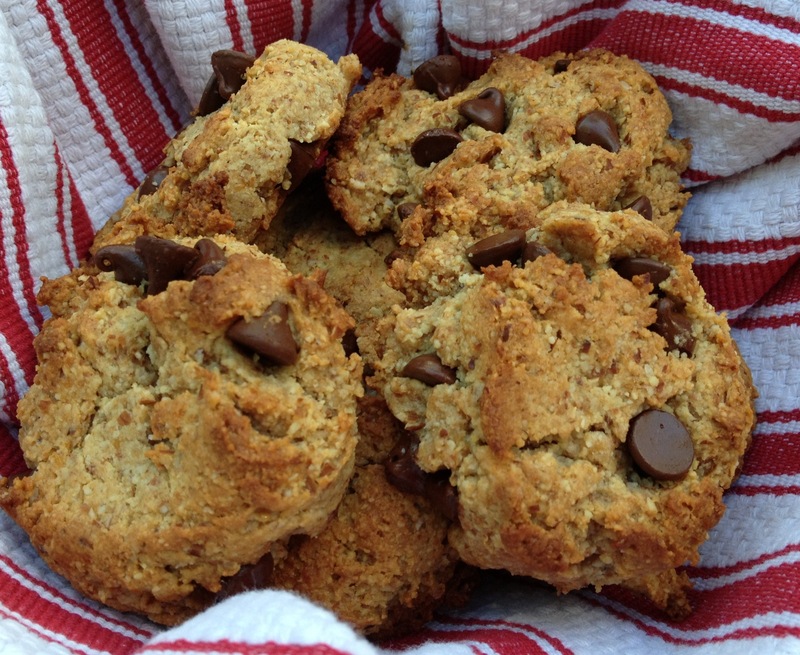 They are hearty, healthy, peanutbuttery goodness that are not only gluten free, but vegan! 1) Preheat your skillet to medium/medium high. 2) In a large bowl, combine your flax seeds and water. Let it sit and congeal for a minute while you pull the rest of your ingredients out. 3) Add melted coconut oil, agave, baking powder, baking soda, peanut butter and vanilla. Whisk together. Add almond milk and whisk again. Add oat flour. Whisk until well blended. 4) Add a little bit of Earth balance (or butter or coconut oil) to your skillet and cook pancakes until brown on each side and cooked through. Chocolate chip scones with almond flour. I love almond flour. And I love chocolate. And I love scones. Do you? 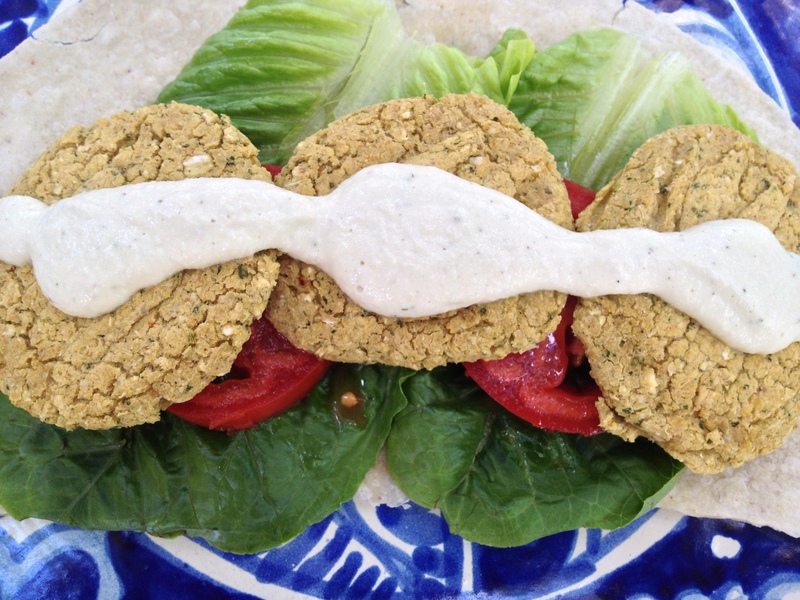 Here is a recipe full of nutritious ingredients. And chocolate. This is one of the recipes I serve to people who don’t eat weird like us and always get compliments! Preheat oven to 350. Line a baking sheet with a Silpat or parchment paper. Make a “flax egg” by mixing flax seeds with water. Set aside. In a large bowl, combine almond flour, salt, and baking soda. In a medium bowl, whisk coconut oil, agave, and “flax eggs” together. Stir wet ingredients into almond flour mixture and combine thoroughly. Use a 1/4 cup and drop batter on baking sheet. Bake 12-17 minutes, until golden brown. 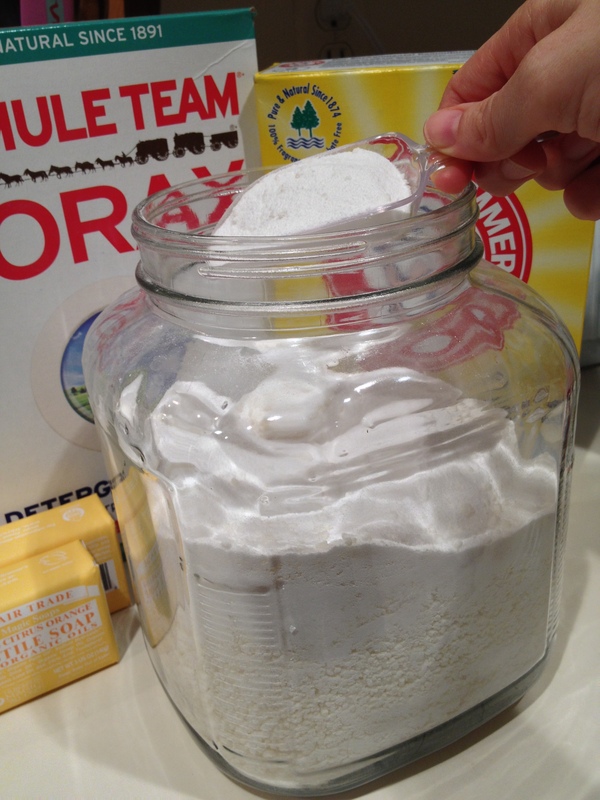 Every time I saw on Pinterest that someone made their own laundry detergent, I would think how it was nice for them, but would never work for me. I truly didn’t believe that the clothes belonging to the MESS of a boy that I adore and call son could EVER be cleaned up with something homemade! And then what about all of my stinky work out clothes? But I kept hearing of friends biting the bullet, so I went for it. I can’t believe each time I do our laundry that this stuff works so well! And even better, the scent is unbelievable! It makes me very happy! Best of all, I am saving money. As far as time, it takes about 15 minutes every two months. I have an old school washer, but my pal Jennifer (check out her awesome blog and health coaching business HERE) has a HE front loader and she uses the same stuff. So YES, you fancy people can use it, too! THREE ingredients! That is all! 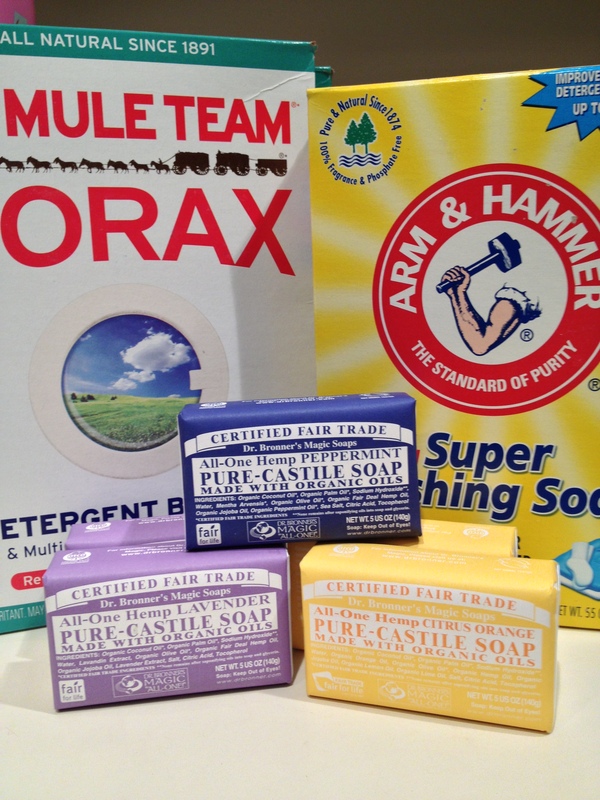 Borax, Washing Soda, and 2 bars of your favorite scented Dr. Bronner’s Magic Soaps. I have three different scents pictured here because I use the Citrus Orange for my sister and the Lavender and Peppermint combined for my mom and for me. But smell them all and pick your favorite! Or make a combo of your own. When I cut the bars of soap before grinding them, I like to cut them against the edge of the soap so that they start to crumble a bit, as pictured above. 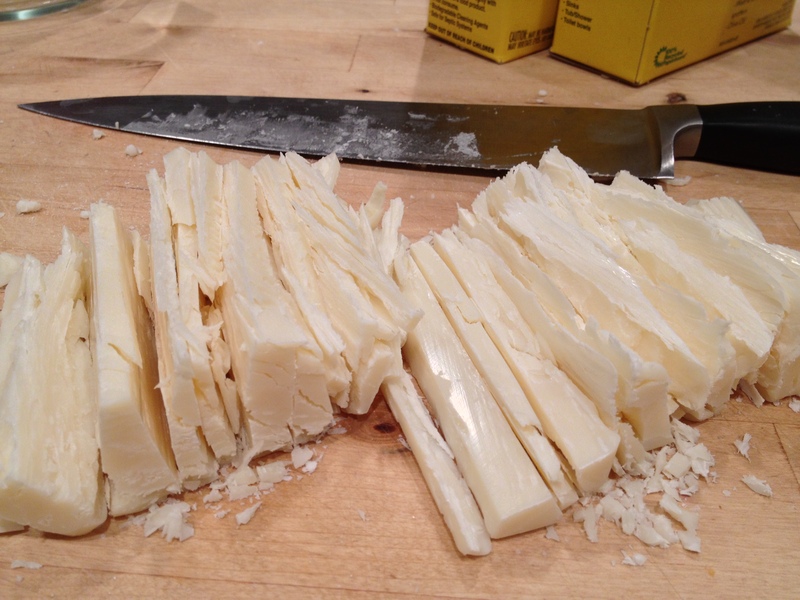 First, slice your bars of soap with a large knife. Then place those pieces in a food processor (I use a Cuisinart…don’t use Vitamix or other blender bc it doesn’t work as well.) Grind them until they are as fine as they will get. You may have to stop and clear the large pieces out of the way if you didn’t slice your bar enough. Then add the Borax and Washing Soda. Turn it on and allow all of the 3 things to mix and the soap to grind even smaller. THAT IS IT FOLKS! I got the container and scoop at The Container Store. For a large load of laundry (and I really fill my washer to capacity), I will use a scoop and a half. I can probably get away with less, but my gym clothes stink and Reid is seriously a MESS, so I don’t take chances! Argentina and a health update. Recently, when people have asked me how I am feeling, I can honestly say that I am feeling better! I am certainly not 100%. I still have to sleep a lot and have at least one or two days every week where I feel crappy. But seriously, who knew knew I would come this far?! It is incredible. As far as my diet goes, I am keeping vegan at home. And once a week or so I will eat some wild fish or some dairy. Still no interest in chicken or meat. Of course I am still gluten free, corn free, and soy free. We came very close to not going. I came down with the flu on Friday (we left on a Tuesday). By Sunday (TWO DAYS BEFORE LEAVING), Reid was throwing up, both kids had fever, I was horribly sick, and Lucky felt like he was getting sick. We prayed for health. We didn’t want to cancel. By Monday, everyone but me was fine. But we still didn’t know if we were going to cancel. By Tuesday(the day we flew out), I turned a corner. God allowed this trip to continue! We were so very grateful! It is amazing to think that I have come this far in my health quest. PLEASE encourage anyone you know with any kind of illness to try eating plant based. I feel like my life has been saved. Remember back when I started this? I felt it was where God was leading me. People thought I was nutso! And I am!! But this is real. My illness is real. And these vegetables have truly given me the ability to travel with my family, to be a part of life, and to start to feel more like myself. I will take a few days a week in bed. I am so very grateful!